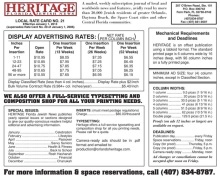 The Heritage Florida Jewish News, established in 1976, is the best way to reach one of Orlando’s most affluent and influential markets. These individuals and families shop carefully, dine out frequently, travel well and invest wisely. Our readers are loyal, well-educated and informed and can become your best customers. And, now you can reach them in print and on the web. 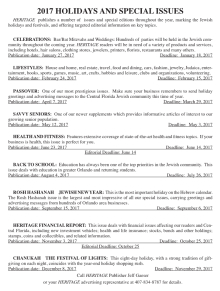 Call Heritage Florida Jewish News Publisher Jeff Gaeser or your Heritage advertising representative at 407-834-8787 for details. Click on the thumbnail above to view our holiday & special issues advertising rate card.